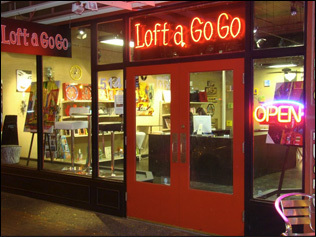 Loft a Go Go is a hip new store on Mill Ave providing the latest contemporary furniture, prints, and accessories. We have convertible sofas, easy chairs, Bombo barstools, cutting edge coffee tables and much more. If you want the most current float mounted prints, Giclees, Dynomighty wallets, or Papayaart pouches, you need to drop in. We get shipments in everyday. New and exciting products arrive all the time. Check out our FaceBook Page for more details, specials and promos. Located In Downtown Tempe, Arizona. Copyright © 2011. Loft a Go Go. All rights reserved.